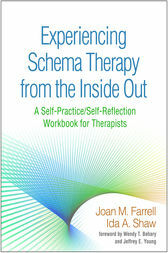 This unique resource helps therapists build their skills in schema therapy (ST) by applying ST techniques to themselves and reflecting on the experience. Designed for use by individuals or groups, the book harnesses the power of self-practice/self-reflection (SP/SR), an evidence-based training strategy. Twenty modules take therapists step by step through using ST to address a professional or personal problem--from establishing safety and creating a self-conceptualization to implementing mode change work, including cognitive, experiential, and behavioral pattern-breaking interventions. In a convenient large-size format, the book is illustrated with vivid therapist examples and features numerous reproducible worksheets and forms for doing the SP/SR exercises. Purchasers get access to a Web page where they can download and print the reproducible materials. Joan M. Farrell, PhD, is Codirector of the Schema Therapy Institute Midwest–Indianapolis Center and Research Director of the Center for Borderline Personality Disorder Treatment and Research, Indiana University–Purdue University Indianapolis (IUPUI). She is Adjunct Professor of Psychology at IUPUI and served for 25 years as Clinical Professor in Psychiatry at Indiana University School of Medicine, where she developed and directed an inpatient schema therapy (ST) program for borderline personality disorder (BPD). Dr. Farrell is coprincipal investigator of an international study of ST for BPD underway in five countries and was principal investigator of a study of group ST for BPD, for which she was awarded a National Institute of Mental Health grant. A Certified Schema Therapist Trainer/Supervisor in individual and group ST, she is Coordinator for Training and Certification on the Executive Board of the International Society of Schema Therapy. Dr. Farrell is the codeveloper of group ST with Ida A. Shaw, with whom she has worked since the 1980s. They provide ST training and self-practice/self-reflection workshops nationally and internationally and have written two prior books as well as numerous book chapters and research articles. Ida A. Shaw, MA, is Codirector of the Schema Therapy Institute Midwest–Indianapolis Center and a Certified Schema Therapist Trainer/Supervisor in individual, group, and child/adolescent ST. She is Training Director of the Center for Borderline Personality Disorder Treatment and Research, Indiana University–Purdue University Indianapolis, and a member of the Training and Certification Advisory Board of the International Society of Schema Therapy. With a background in experiential psychotherapy and developmental psychology, Ms. Shaw is the codeveloper of group ST with Joan M. Farrell, with whom she has worked since the 1980s. They provide ST training and self-practice/self-reflection workshops nationally and internationally and have written two prior books as well as numerous book chapters and research articles. Ms. Shaw is the main clinical supervisor of an international multisite trial of group ST and supervises the practice component of additional research projects on avoidant personality disorder, dissociative disorders, complex trauma, and child/adolescent treatment.